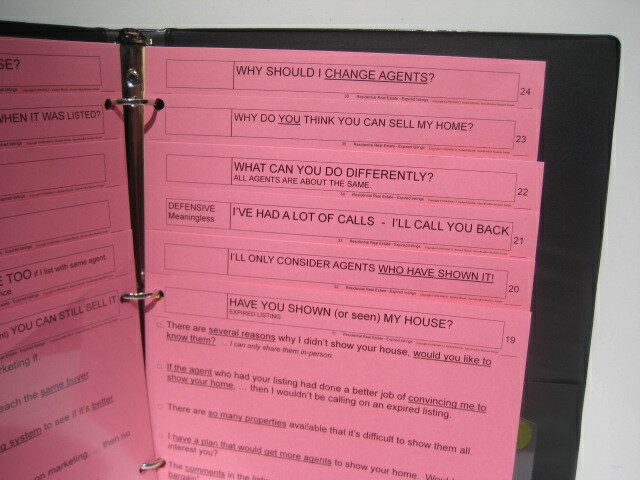 Sales scripts and prospecting scripts for real estate agents, financial services, insurance agents and mortgage brokers. 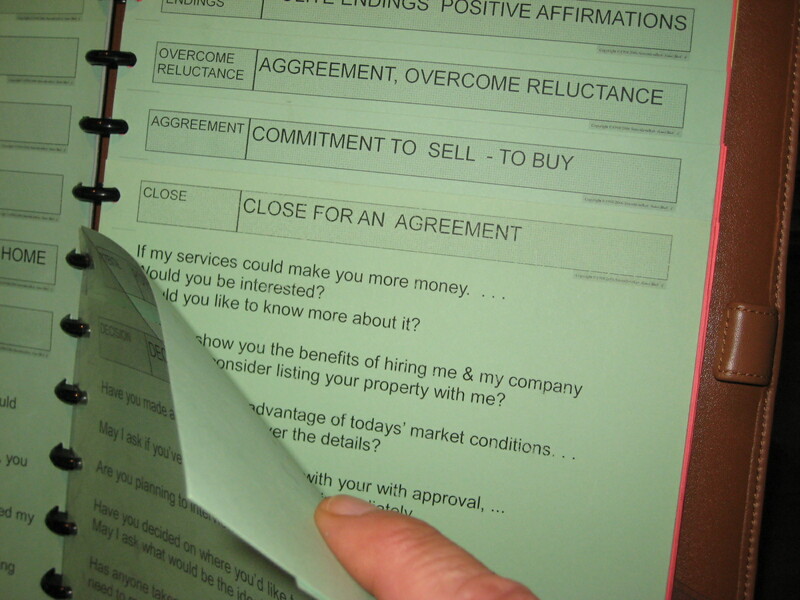 Smooth-talker Sales Scripts are for prospecting, selling, and business development. Simply stand the sales script up in front of you when you make prospecting calls. Then flip to an appropriate heading and read any one of the 6 lines of dialogue to the prospect. Smooth-talker sales scripts contain the key dialogue to use after you introduce yourself and give the prospect a reason for the call. That’s the critical point in time that a prospecting call can go in any one of three directions. 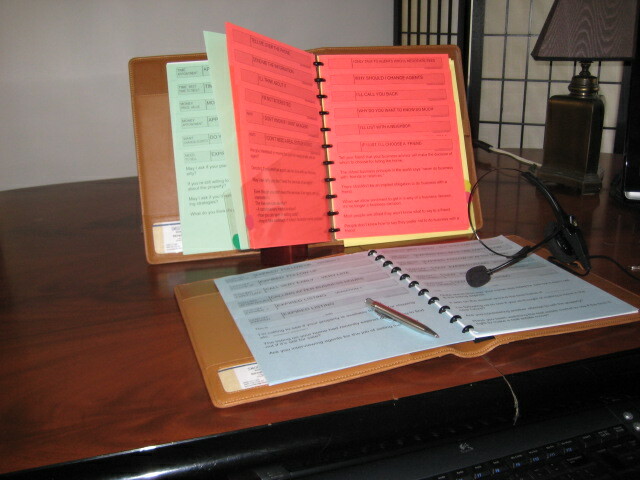 The scripts are easy to uses because of the three color-coded sections that have over 300 lines of powerful dialogue that prepares you for the next 5 to 20 minutes of a prospecting call. The objective is to carry on with a sales conversation. The goal is to get an appointment and to get the sale. They are .... 1. When you are doing the talking. 24 pages printed on GREEN cardstock. Usually asking questions & asking for an appointment. 2. Responses to questions & objections. 24 pages printed on RED cardstock. Rebuttals for the common objections & questions. 3. Selling your products and services. 12 pages printed on YELLOW cardstock. Reasons & benefits to purchase your products & services. "Just stand the script book up in front of you and dial the phone." A total of 60 pages that you can access at a glance. Includes a 24 page Instruction Book and a "script writing kit." Over 150 responses to Objections & Questions. 100's of lines of dialogue to ask for an appointment. Hundreds of ways to sell your product or service. 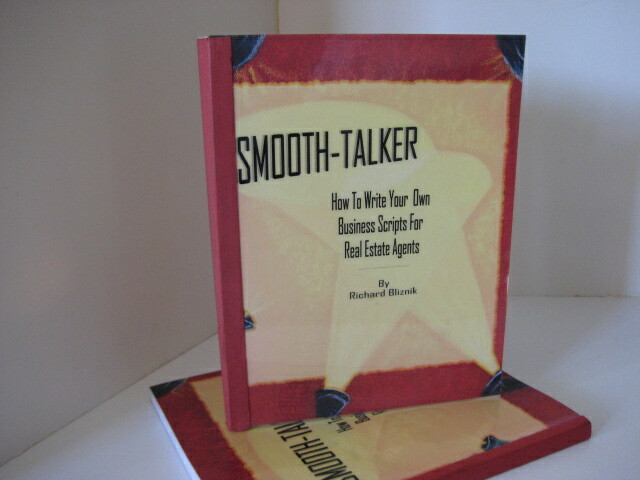 Smooth-talker Sales Scripts are ready to use right out of the box! The sales scripts are all cut-down & completely assembled. Comes in a high-quality Leatherette 3-ring binder. 60 pages printed on heavy 90lb. cardstock. 24 page Instruction Book for writing your own additional scripts. "Scriptwriting Kit" plus extra pages and an assortment of card-stock. We're so sure you'll be satisfied with our sales scripts that we'll give you a 30 day "money back guarantee." Residential Real Estate. Commercial Real Estate. Expired Listings. Commercial Real Estate Listing. Cold-calling and farming. Commercial Real Estate Leasing. Notice of Default, Short-sale, Foreclosure. 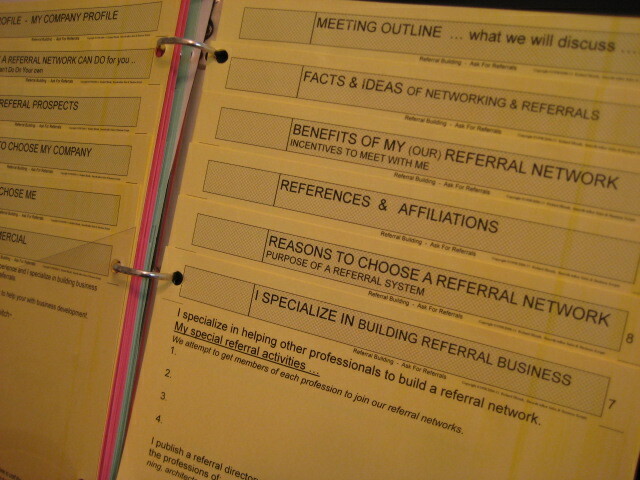 Referrals. "Scripts for talking to a referral source." New Licensed Real Estate Agents. 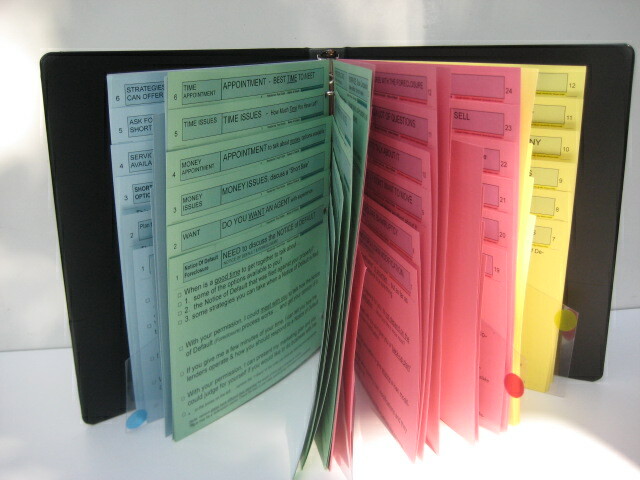 Referral scripts. "Asking other sales professionals for referrals"
Networking to build referral business. "Join my local referral networking group"
Licensed Professionals. Business & Corporate Sales. Financial services & Financial planners. Prospecting for the sale of Products. Mortgage lenders & Loan brokers. Prospecting for the sale of Services. 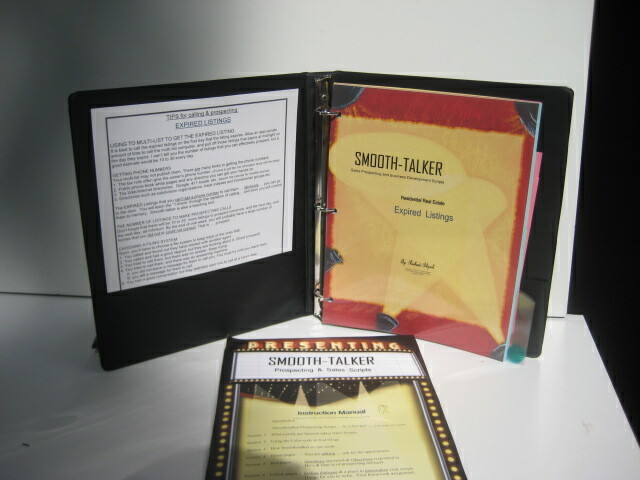 To receive free sample sales scripts just e-mail: smoothtalker@roadrunner.com or phone us at 949 673-1300. Color-coded for efficiency. The most important feature of our sales scripts is the speed & accuracy that helps you select the dialogue you need. 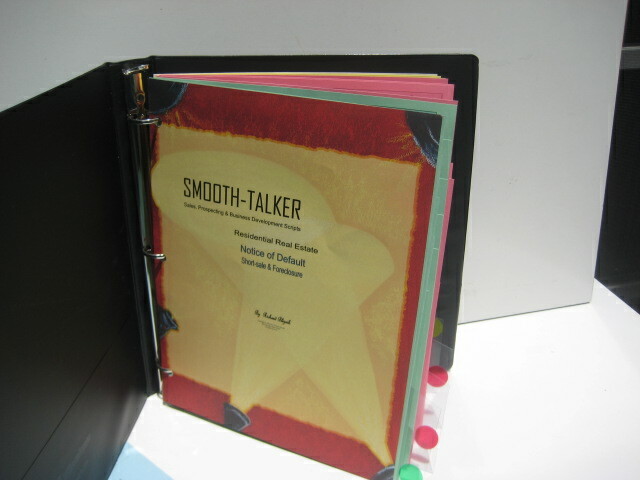 Smooth-talker uses the same colors as a "traffic signal." Everyone in the world knows that you: go on green, stop on red, and proceed with caution on yellow. It's just about fool-proof. appointment. The lead-off scripts are for the first 30-90 seconds that identifies you, gives a reason for the call, and a brief selling message. up to 6 different answers and approaches to handing the objection. 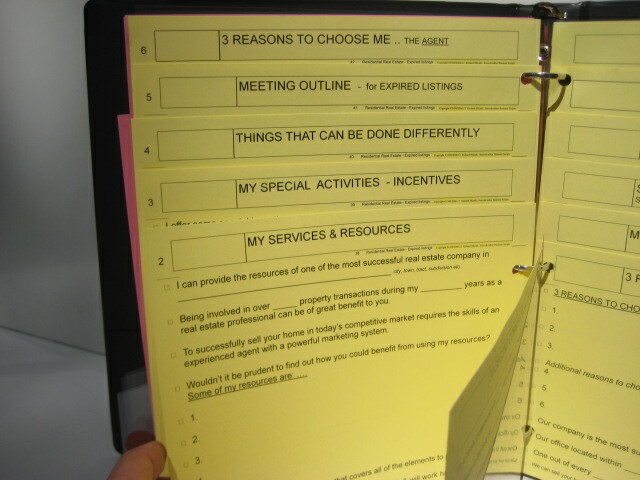 YELLOW 12 pages designed to sell your products & services and reasons that the prospect should do business with you. There are places to personalize your scripts and put the personal information that you should have at your fingertips. 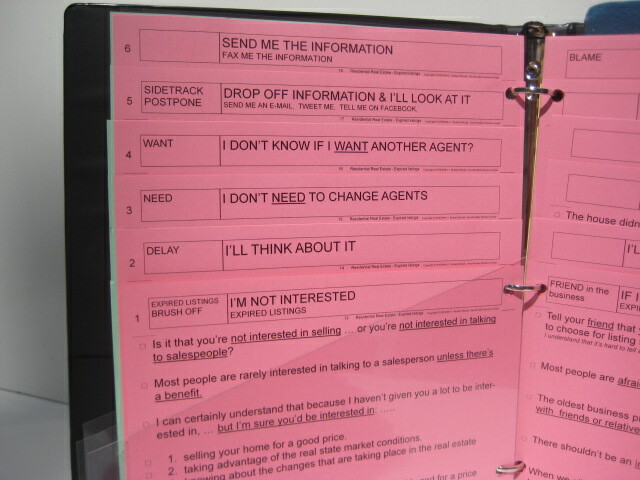 GREEN page headings that represent the questions you should ask a prospect about: Need, Want, Money, Time, Potential, Agreements, Closings, etc. RED pages. When you must stop talking & listen to the prospects objections. Then you can respond with any one of 6 lines of dialogue. YELLOW pages. Designed to sell your products & services. Information that tells the prospect about you, your products, and your services. Each line of dialogue has been chosen from our collection of 5,000 1-liners that we have in our files. We chose 300 of the very best. Every word of was researched & developed under real-world prospecting conditions. The scripts are in the form of random access "1-liners" that let you choose a line of dialogue instead of following a strict multi-sentence structure. 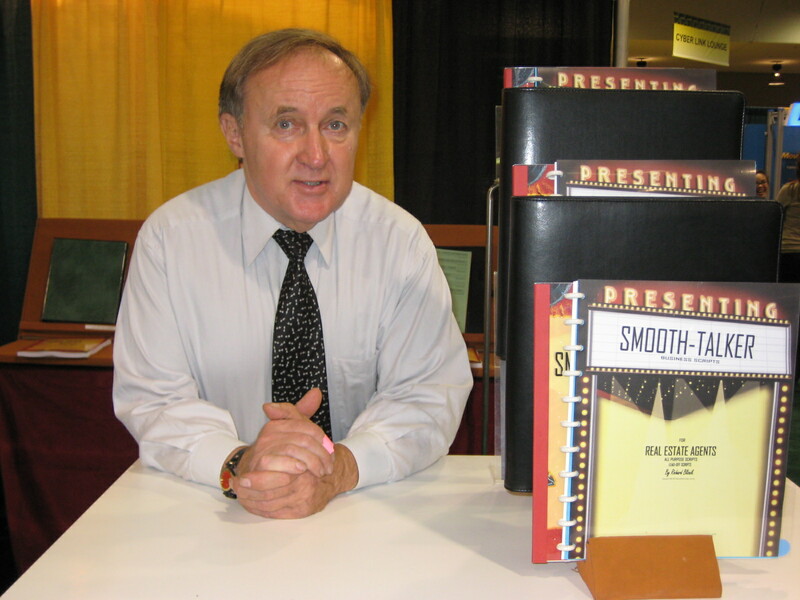 Smooth-talker sales scripts require a lot of labor & expensive materials to produce. Lazer printed on heavy 90lb. card-stock to withstand the constant flipping of them during a propecting call. They cost very little in comparison to their payback. High quality sales scripts are hard to find. Our research shows that it's nearly impossible to find any useful sales scripts. Search the internet and see for yourself. Written in the 1st. person. ... For the sales professional who is prospecting for their own potential clients by making their own calls. Written in the 3rd. person. ... For the telemarketers & sales-assistants who work on the sales professionals behalf. The dialogue tells the prospect who they are representing by mentioning them by name. 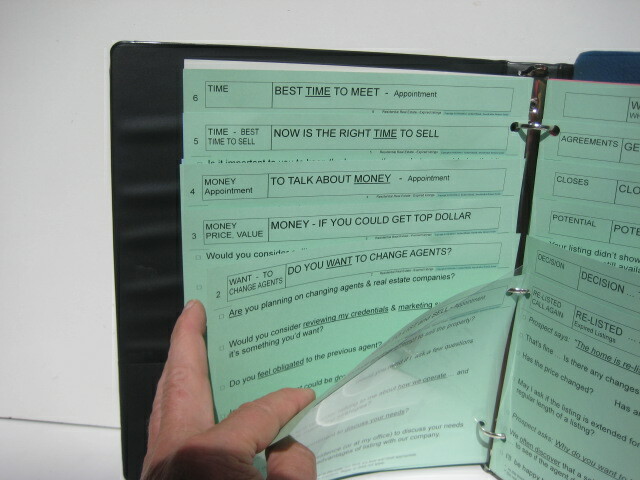 Smooth-talker Sales Scripts contain the dialogue that is usable in the real world of prospecting & business development. The dialogue can also be used in all sales and business conversations. Shown is an upgrade to a Multi-ring binder and a genuine Leather portfolio. Thanks to all who stopped by our booth at the California Association of Realtors exposition.